Dr. Gyimah Emmanuel Kofi is a senior lecturer with the University of Cape Coast and currently the H.O.D of the Department of Educational Foundations, Faculty of Education.He graduated UCC in the year 1989 with first class honors and went on to become a Senior Research Assistant. A man who did not have a much caring father defied the odds and is now the Head of Department. This interview was done by Mr. David Banaaleh at the office of Dr. Gyimah Emmanuel. 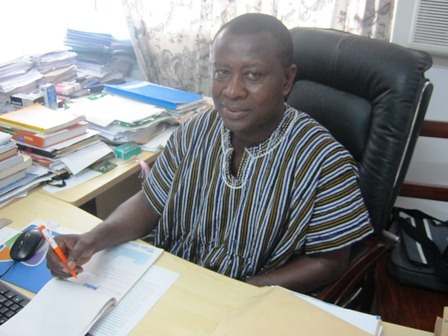 Chsm – Who is Dr. Gyimah? H.O.D – Thank you very much. Dr. Gyimah Emmanuel Kofi is a lecturer, in fact a senior lecturer with the University of Cape Coast and currently the H.O.D of the Department of Educational Foundations, Faculty of Education. Chsm – How did you reach where you are today? H.O.D – That is a very interesting question, how I reached where I am today. I would say that it had to do with perseverance, it had to do with, you know, the determination to succeed. I must say that I had my secondary education at SDA secondary school, Bekwai in the Ashanti Region, and later entered the University of Cape Coast in 1989 and through hard work, I graduated obtaining first class honors and was appointed Senior Research assistant, in fact the very first in the Faculty of Education, in 1993 and had the opportunity to work under Dr. Dominic Fobih who during the N.P.P era, was once the minister of education, and now a Professor. Later I enrolled t do my masters in Special Education, MPhil Special Education in the University of Cap Coast. Then in 2003/4 I won a scholarship to study in the University of Leece in the United Kingdom. I came back in 2007 and I have since worked in this department as a senior lecturer. Chsm – With all these, did you find challenges in your educational life? H.O.D – Plenty, plenty, plenty. You know during the backdrop, that I never had a father that was that caring and at the time I entered the university, my father was not there. He was dead. Ermm when I entered the university, it was so difficult. There were even times when I will not go home when school was on vacation but I had to stay on campus. I must say that it was not easy and I must also point out that, when I became a Senior Research Assistant and was at the same time doing my Masters that I had to work and study concurrently. It was not easy. It was not at all. And then at the time we were doing our research that is the thesis we were not privileged to have supervisors who could consistently supervise our work and to my contemporaries those I was in the same class with, what we found out was that we had to largely depend on our own resource to do our Masters. It wasn’t easy but like I indicated, it was just with perseverance, fortitude, that resilience you know, to achieve, that actually made it possible for me to be able to get to where I am. Stay tuned for the full interview coming soon.